I must say Pasta is probably my most favorite food to eat. Bolognese sauce is one of my most favorites. Today I decided not to go to my usual Bolognese which is delicious but very heavy and rich. I went with a lighter approach today using Turkey and Chicken Sausage because I couldn’t find italian turkey sausage and didn’t feel like hunting it down, and the chicken sausage worked just fine. I did use dark meat turkey because it is much more flavorful, it is ideal but if you really don’t want to use the dark meat use 1/2 white and 1/2 dark or all white meat . The only negative to this sauce is that it really needs 3- 4 hours for the sauce to cook down. The longer the sauce cooks the more flavorful it will be. This sauce would probably serve 4 nicely with 1 lb. of pasta. You can easily double it and freeze the leftover sauce. So nice to have it in the freezer and just have to make the pasta and you have a wonderful homemade meal. I have now started serving the sauce over shredded zucchini and spaghetti squash. It is so delicious and you may feel a little bit better eating it over zucchini or spaghetti squash than noodles. Pasta or Vegetable it’s pretty awesome. Look on my blog for Zucchini Bolognese Recipe for how to recipe, posted 12/20/2012. 1 lb. Italian style Turkey or Chicken Sausage, removed from casings. 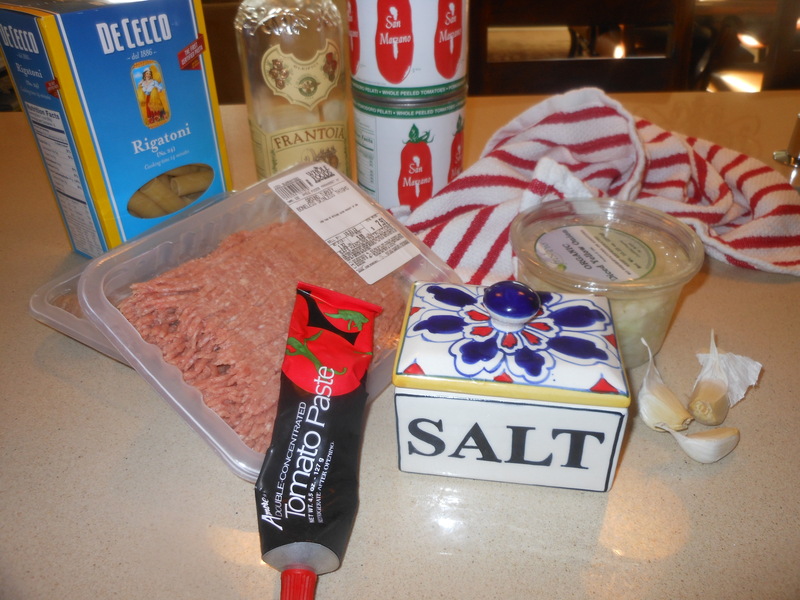 You can also mix in hot or sweet Italian pork sausage if you don’t mind using the pork. Heat 3 tablespoons of the olive oil in a large heavy pan over medium high heat. ( I use my Le Creuset ) Add the sausage meat and break it up as it cooks, turning now and then, until browned all over, about 10 minutes. Remove the sausage with a slotted spoon to a bowl and set aside, add the ground turkey to the pan along with a good pinch of salt and a few fresh grind of pepper. Cook the meat stirring here and there, for 10 minutes as well, till meat is nicely browned. I remove and put in bowl with the sausage which was set aside. Add another 3 tablespoons of olive oil to the pan and add the onions and garlic. Cook until onion breaks down and gets soft, another good 10 minutes. Add the tomatoes and their juice along with 1/2 cup of water. 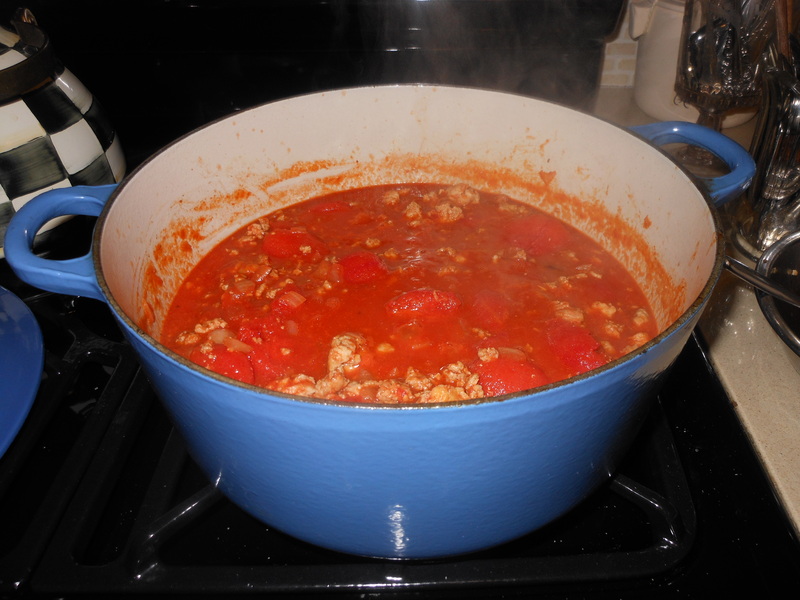 ( You may need more water as you go) Add the sausage and ground turkey, stir the sauce well. Bring the sauce to a boil, season to taste with salt and pepper and turn the heat to low. Cover almost completely with a lid (allowing a little steam to escape) and gently simmer for 4 hours. You may want to add splashes of water if sauce is drying out. After 2 hours I added the 1/3 cup of Tomato Paste, and replace lid and continue simmering for 2 more hours. I added water as it cooked, you’ll have to judge for yourself how much water you add. I added 1/4 cup at a time. When the sauce is ready for serving, bring a large pot of water and prepare pasta according to package directions. 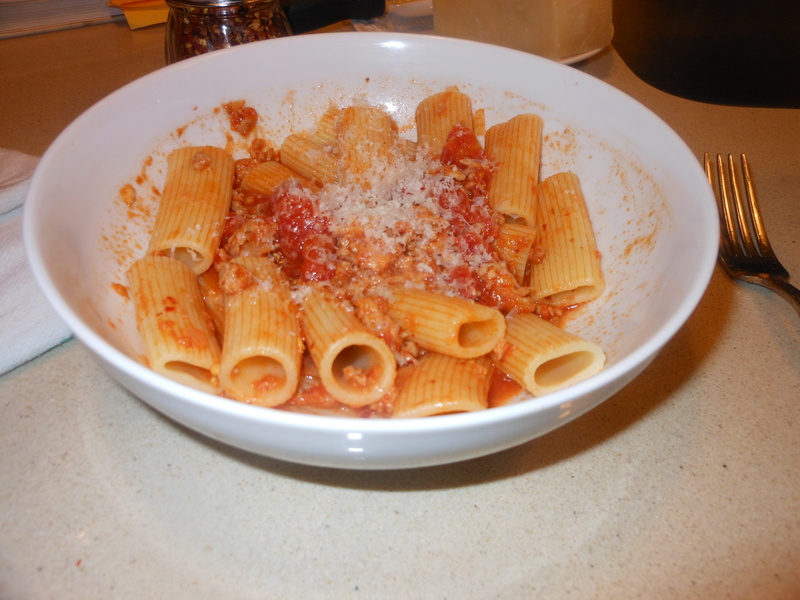 serve with sauce over the rigatoni ( or any pasta you like) with a nice grating of Parmesan. *so many stores now sell zucchini already shredded and it’s dry and ready to go. The only problem with doing it yourself is that you must get the extra moisture out. *Spaghetti Squash – just have the store cut it in half because it’s a tough one to cut at home. Preheat oven to 350 degrees and scoop out the seeds. Spray a rimmed baking sheet and turn squash open side down on baking sheet and cook till soft, probably 45 minutes or so. Remove from oven and with a fork remove the inside of the squash into a bowl, it comes out like very thin spaghetti. It is finally cold out and it’s the time of year I break out my Le Creuset and make some heartwarming Bolognese sauce. It’s November so let’s make Turkey Bolognese!!! 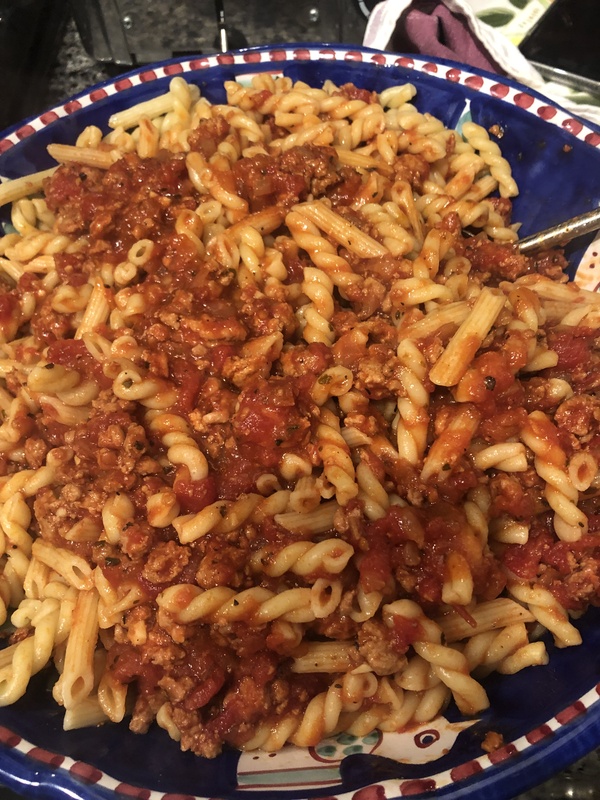 This is one of our most favorite meals and I will have enough sauce for 2 meals because one 1/2 will get frozen for another day when I don’t have the time to cook. Perfect Sunday night meal. I must say Pasta is probably my most favorite food to eat. Bolognese sauce is one of my most favorites. Today I decided not to go to my usual Bolognese which is delicious but very heavy and rich. I went with a lighter approach today using Turkey and Chicken Sausage because I couldn’t find italian turkey sausage and didn’t feel like hunting it down, and the chicken sausage worked just fine. I did use dark meat turkey because it is much more flavorful, it is ideal but if you really don’t want to use the dark meat use 1/2 white and 1/2 dark or all white meat . The only negative to this sauce is that it really needs 3- 4 hours for the sauce to cook down. The longer the sauce cooks the more flavorful it will be. This sauce would probably serve 4 nicely with 1 lb. of pasta. You can easily double it and freeze the leftover sauce. 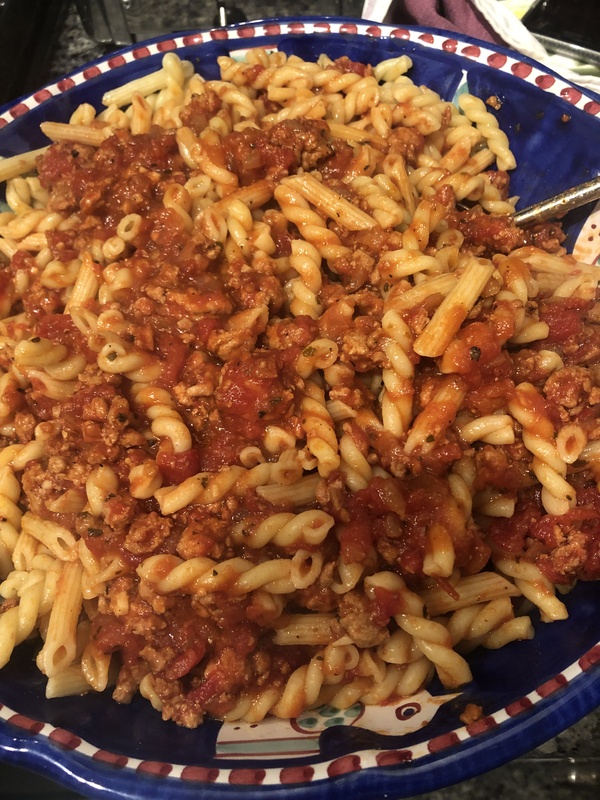 So nice to have it in the freezer and just have to make the pasta and you have a wonderful homemade meal. I have now started serving the sauce over shredded zucchini and spaghetti squash. It is so delicious and you may feel a little bit better eating it over zucchini or spaghetti squash than noodles. Pasta or Vegetable it’s pretty awesome. Look on my blog for Zucchini Bolognese Recipe for how to recipe, posted 12/20/2012. The weather has finally gotten cold enough to make me want to cook some heartwarming meals and this has to be one of our all time favorites. I will be making enough to eat some tonite and freeze the sauce for another meal when I don’t have the time to make the sauce. Perfect Sunday night food. I must say Pasta is probably my most favorite food to eat. Bolognese sauce is one of my most favorites. Today I decided not to go to my usual Bolognese which is delicious but very heavy and rich. I went with a lighter approach today using Turkey and Chicken Sausage because I couldn’t find italian turkey sausage and didn’t feel like hunting it down, and the chicken sausage worked just fine. I did use dark meat turkey because it is much more flavorful, it is ideal but if you really don’t want to use the dark meat use 1/2 white and 1/2 dark or all white meat . The only negative to this sauce is that it really needs 3- 4 hours for the sauce to cook down. The longer the sauce cooks the more flavorful it will be. This sauce would probably serve 4 nicely with 1 lb. of pasta. You can easily double it and freeze the leftover sauce. So nice to have it in the freezer and just have to make the pasta and you have a wonderful homemade meal. I have now started serving the sauce over shredded zucchini (zucchini linguine) and spaghetti squash. It is so delicious and you may feel a little bit better eating it over zucchini or spaghetti squash than noodles. Pasta or Vegetable it’s pretty awesome. Look on my blog for Zucchini Bolognese Recipe for how to recipe, posted 12/20/2012. 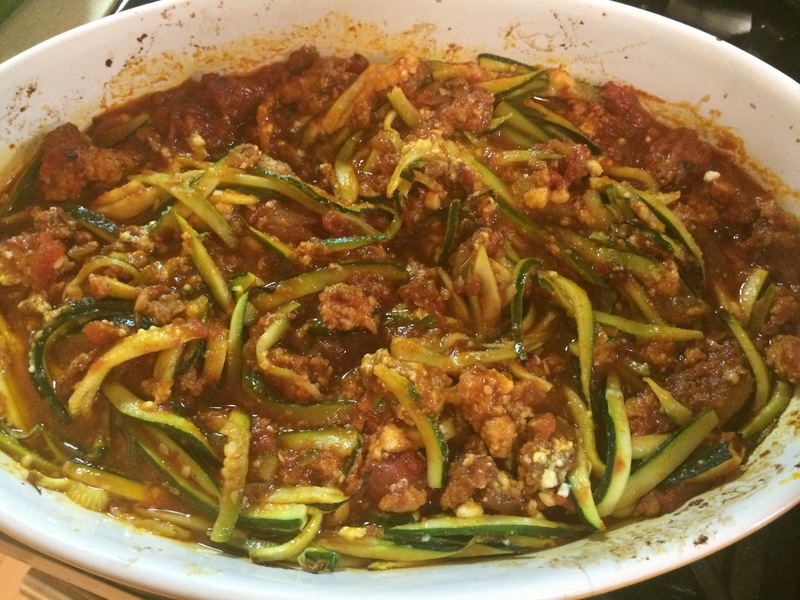 For full recipe on Zucchini/Squash go to my Zucchini Bolognese Recipe.